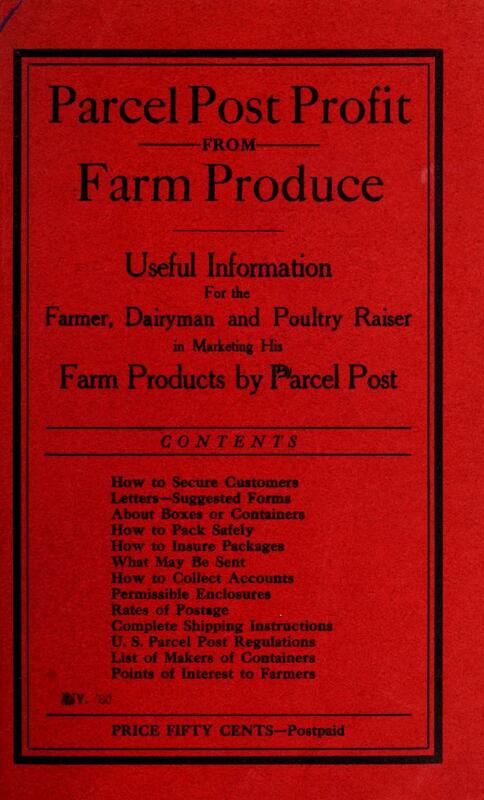 This Booklet is intended to convey information essential to prospective shippers of farm products by means of the parcel post, and should be very carefully read before shipments are undertaken. 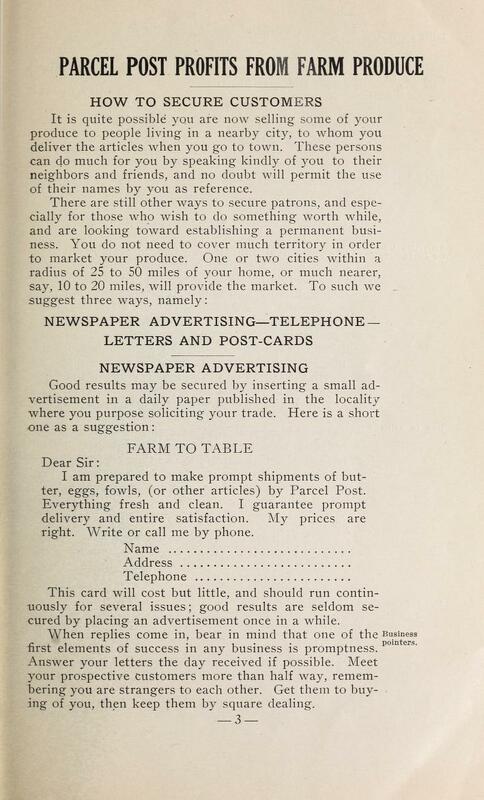 The producers of farm products now have unlimited possibilities for the expansion of their business. 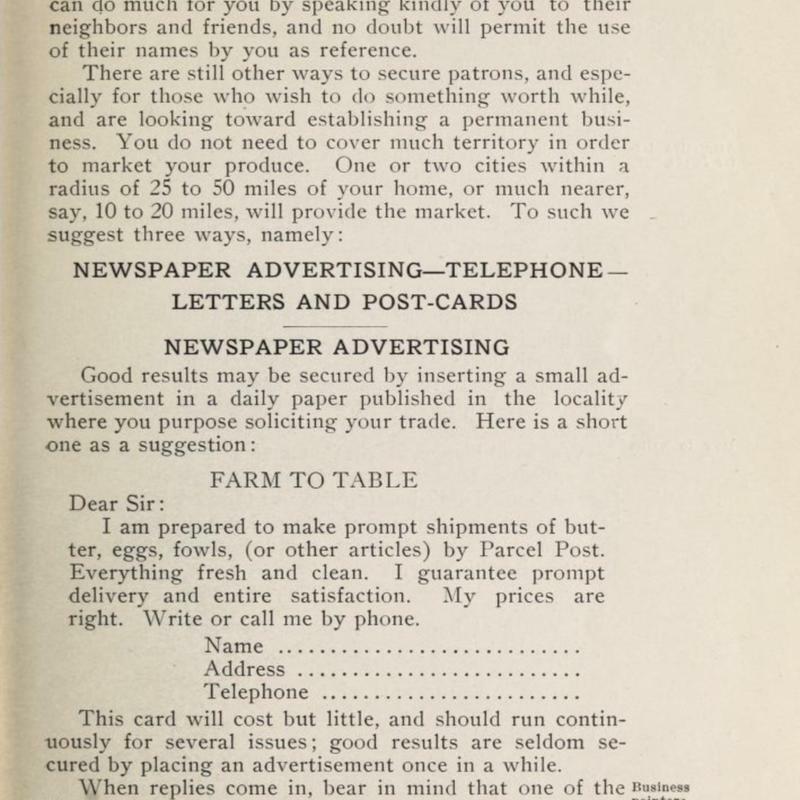 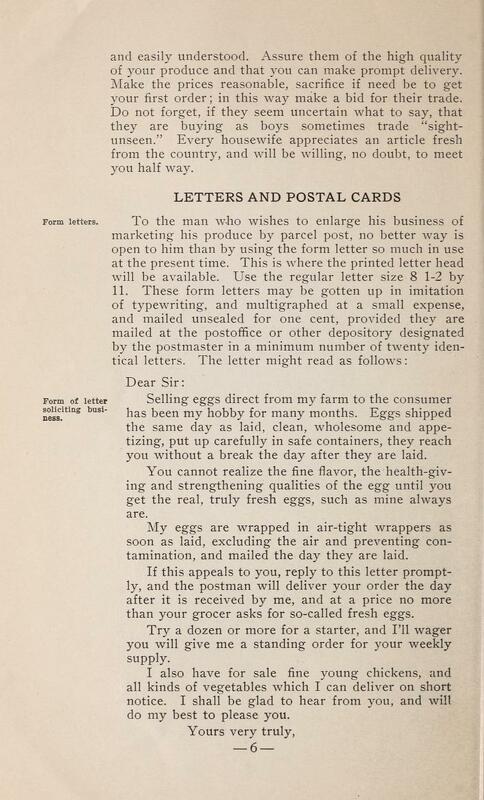 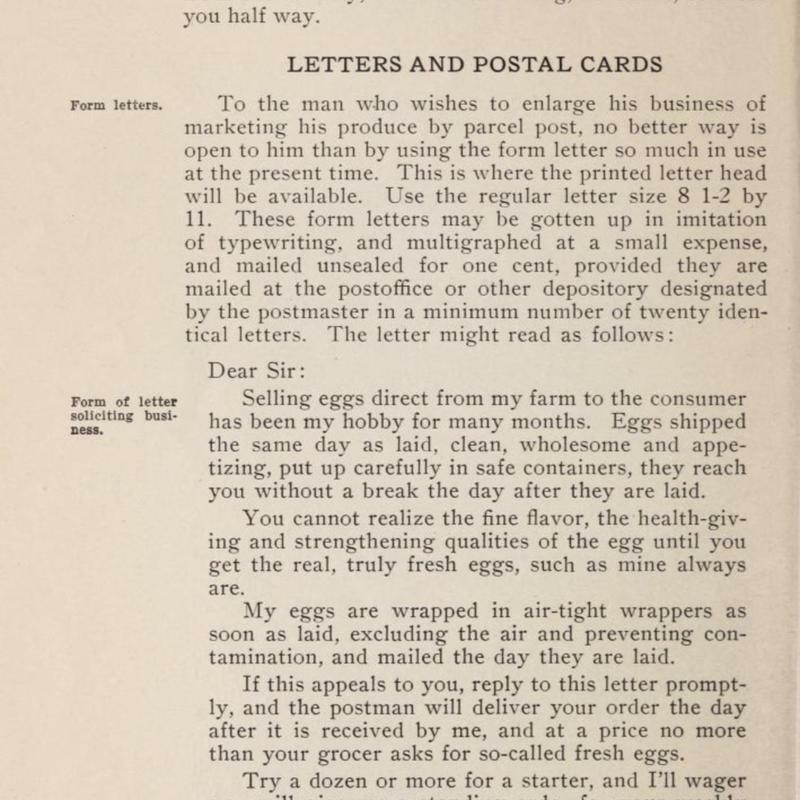 At the post offices where this plan has been encouraged and promoted, it is a pronounced success, and every inducement is offered to the farmer and fruit grower, the dairyman and poultry raiser, to interest him in the parcel post as a means to marketing his products. 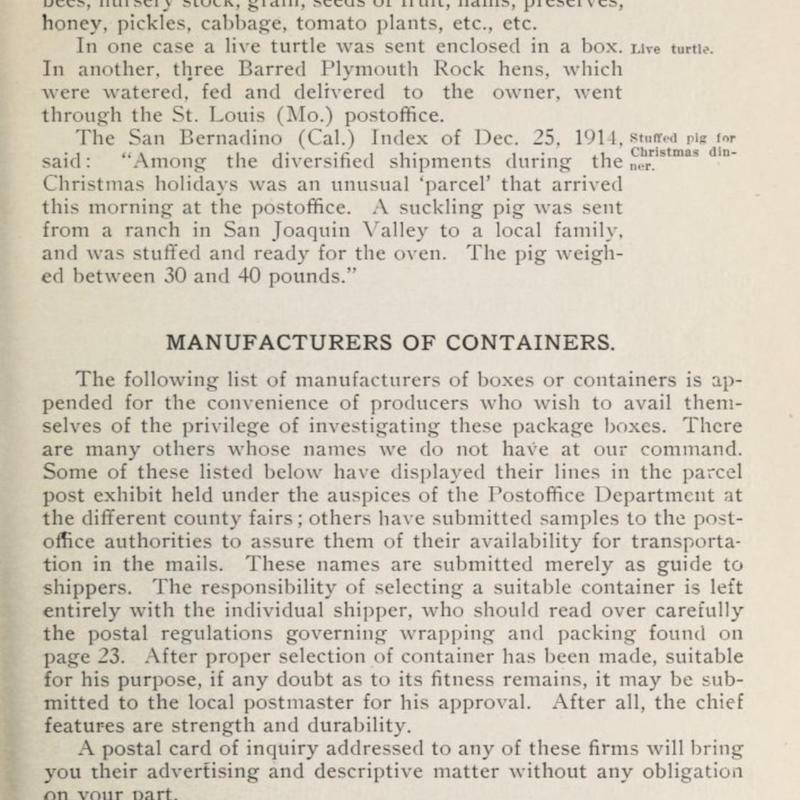 Charges have been materially reduced, and the weight limit considerably increased upon matter intended for delivery within the first two zones, a radius of 150 miles. 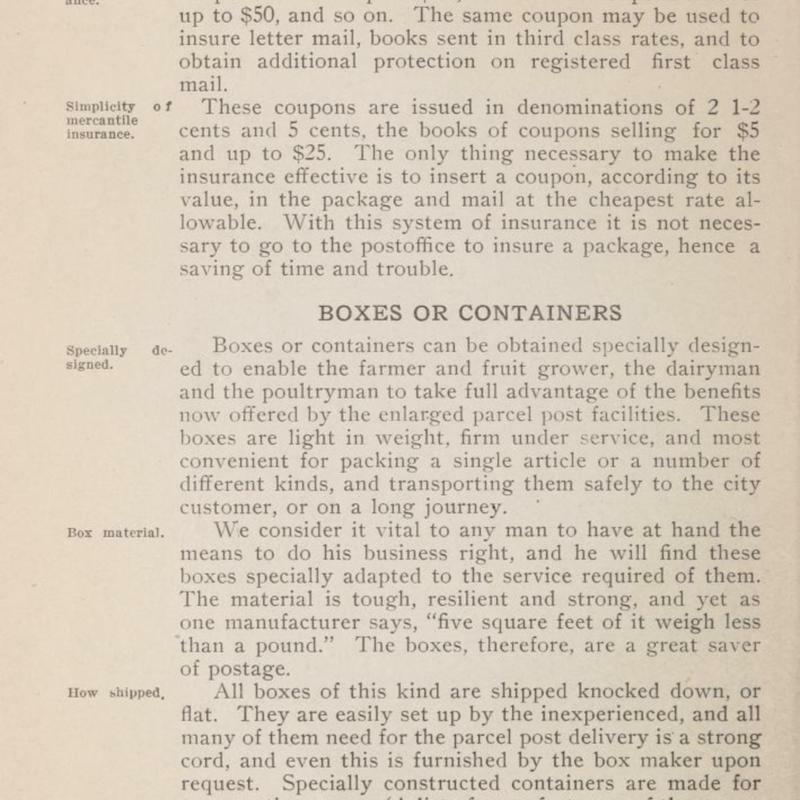 It has been found that the greatest obstacle in extending the producer-to-consumer plan is the misunderstanding on the part of the country people about the price city folks can or will pay. 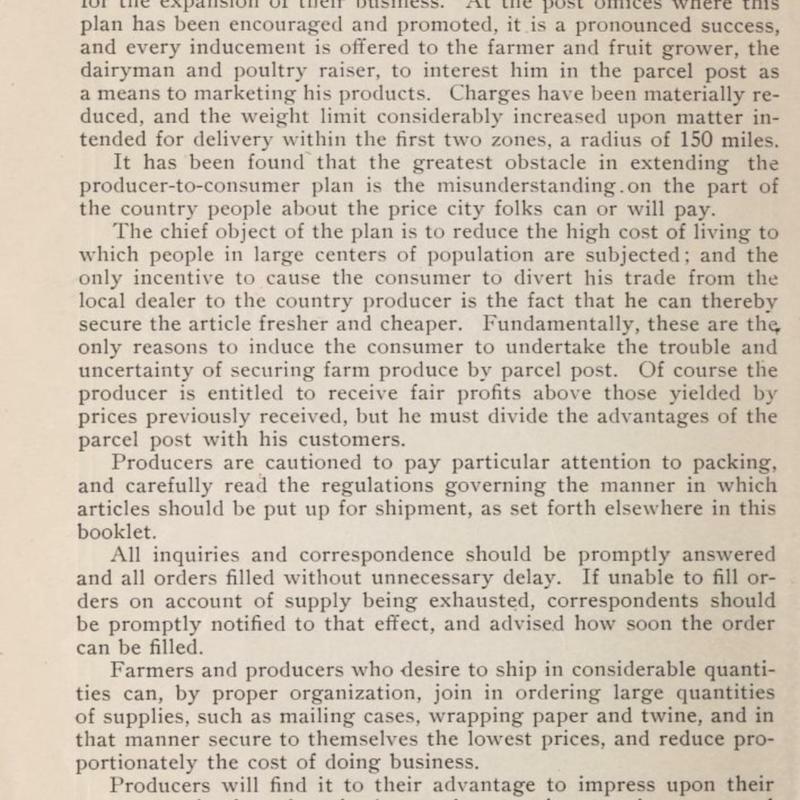 The chief object of the plan is to reduce the high cost of living to which people in large centers of population are subjected; and the only incentive to cause the consumer to divert his trade from the local dealer to the country producer is the fact that he can thereby secure the article fresher and cheaper. 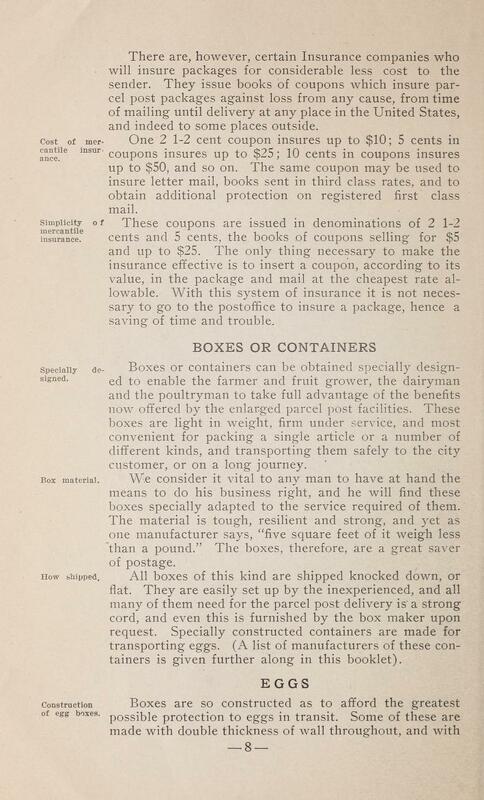 Fundamentally, these are the only reasons to induce the consumer to undertake the trouble and uncertainty of securing farm produce by parcel post. 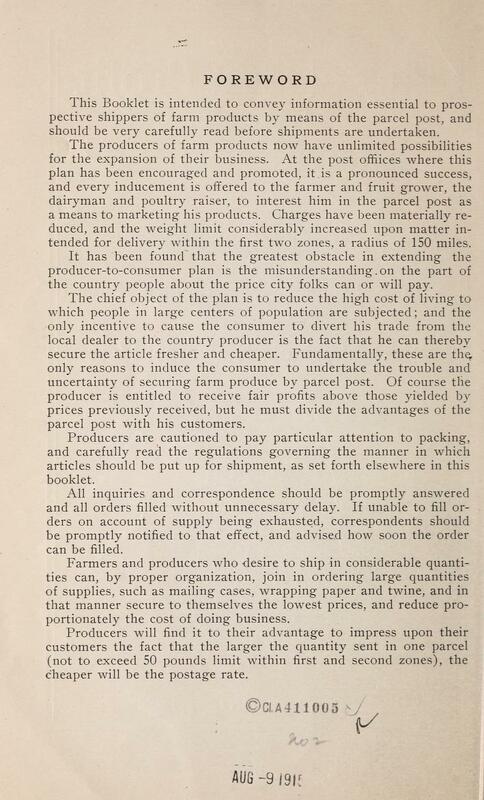 Of course the producer is entitled to receive fair profits above those yielded by prices previously received, but he must divide the advantages of the parcel post with his customers. 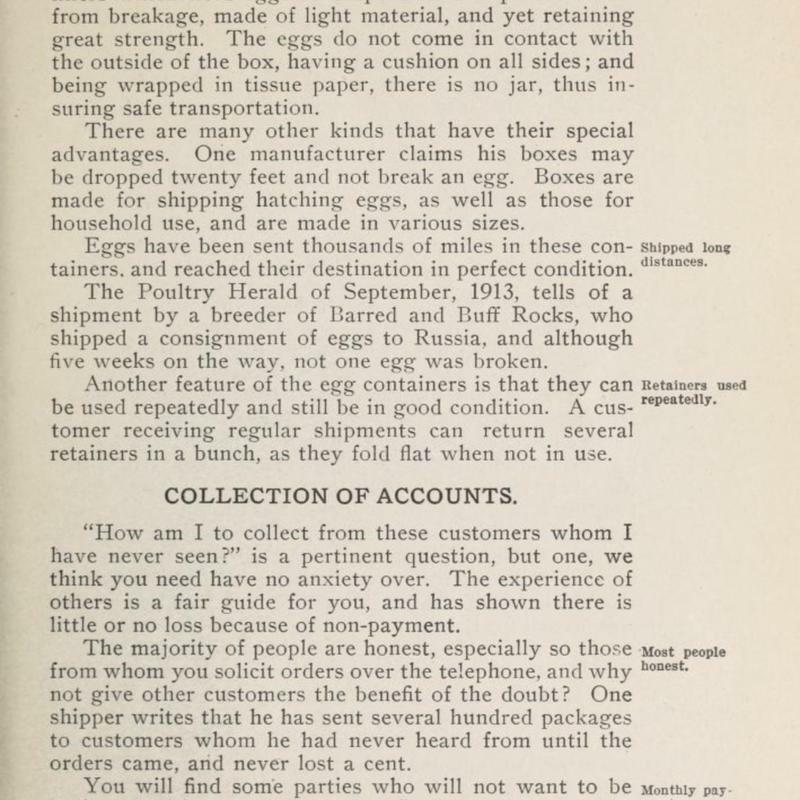 Producers are cautioned to pay particular attention to packing, and carefully read the regulations governing the manner in which articles should be put up for shipment, as set forth elsewhere in this booklet. 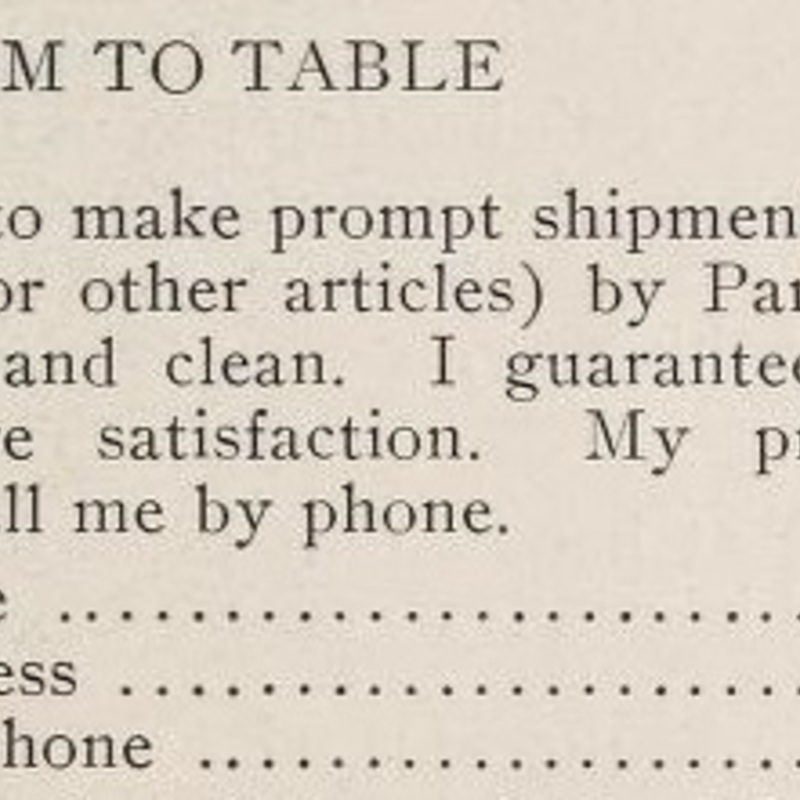 All inquiries and correspondence should be promptly answered and all orders filled without unnecessary delay. 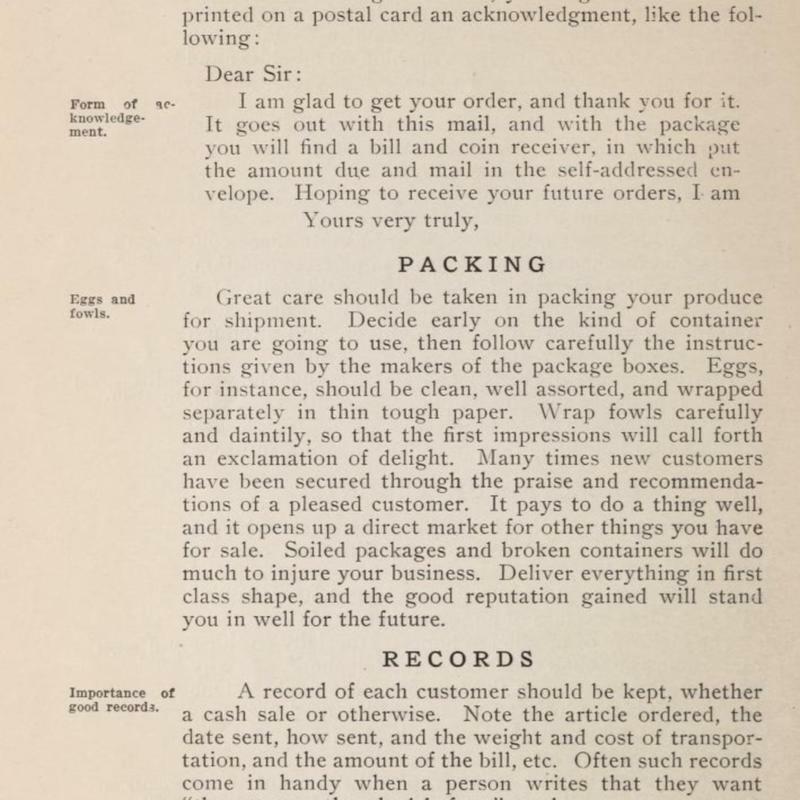 If unable to fill orders on account of supply being exhausted, correspondents should be promptly notified to that effect, and advised how soon the order can be filled. 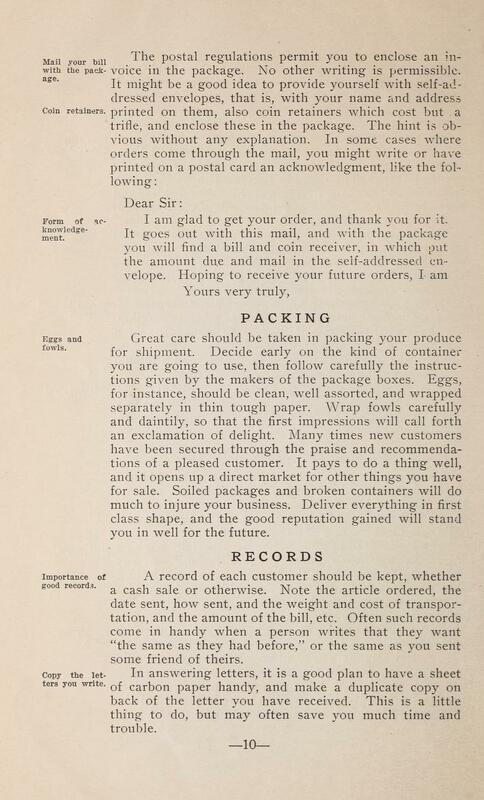 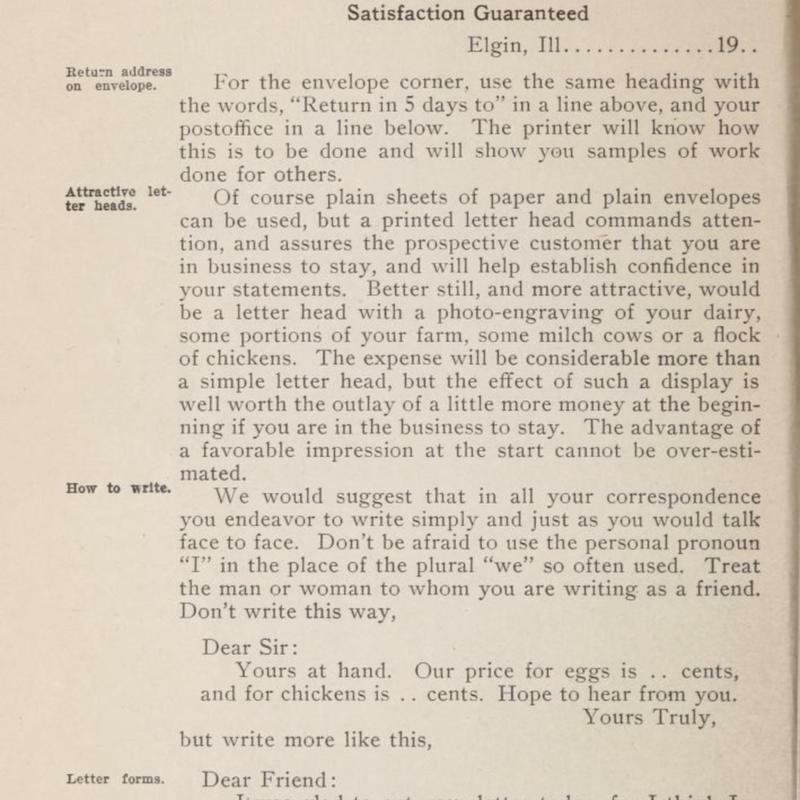 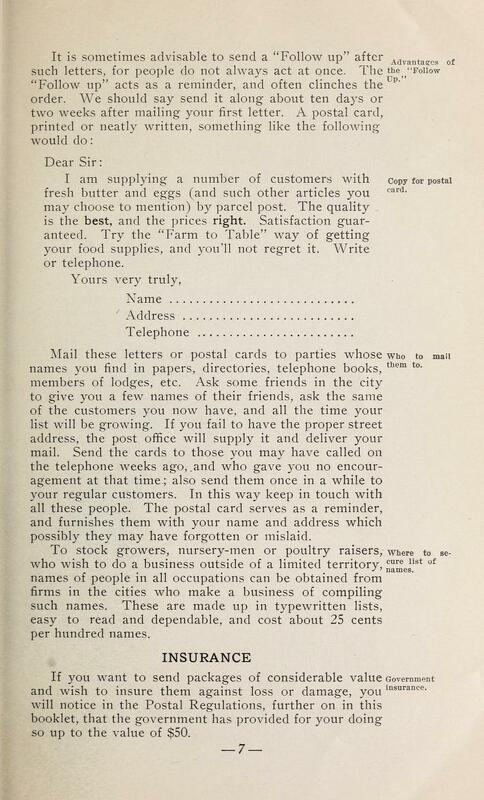 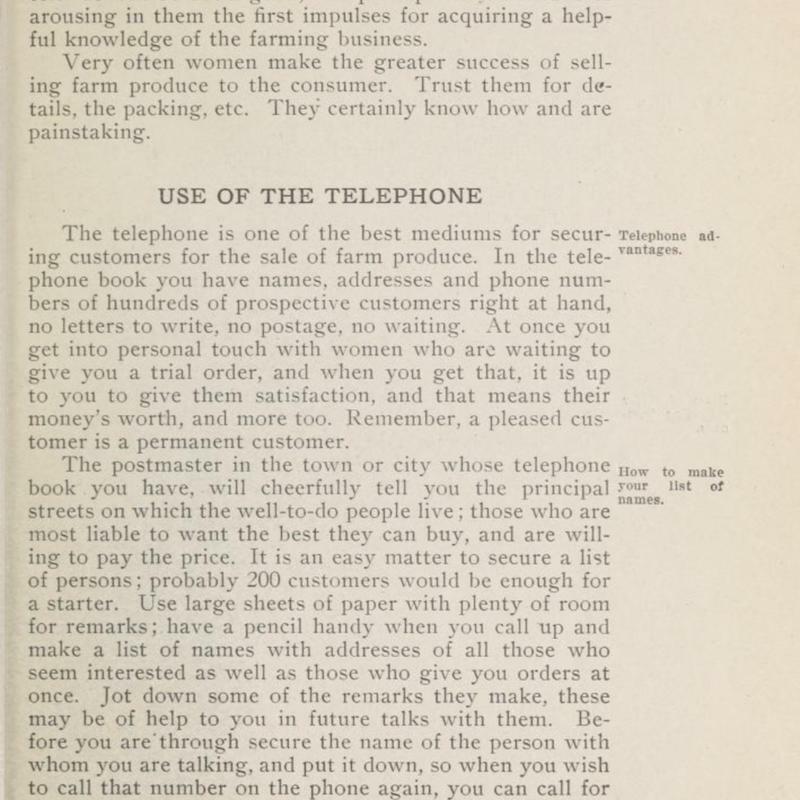 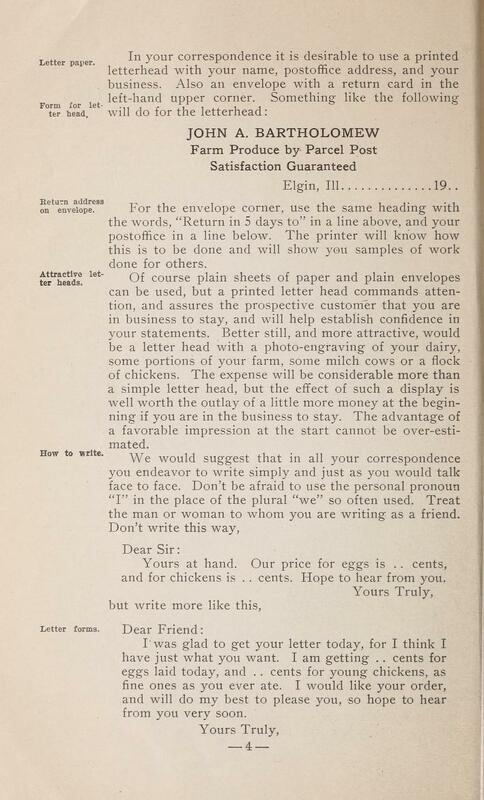 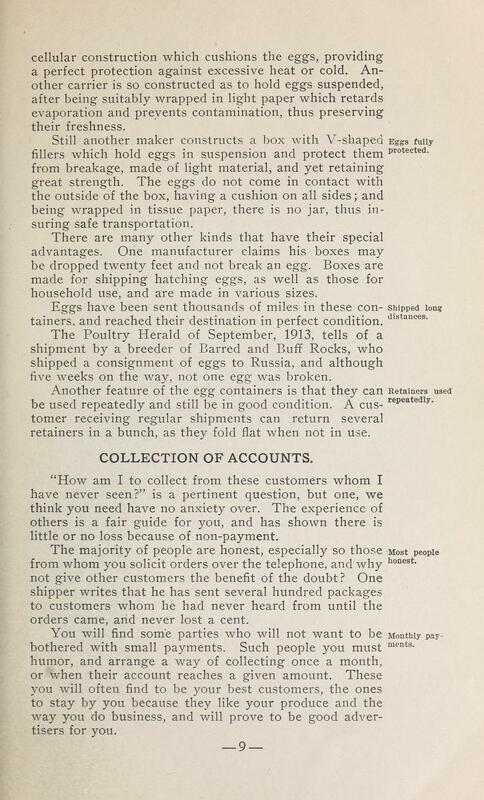 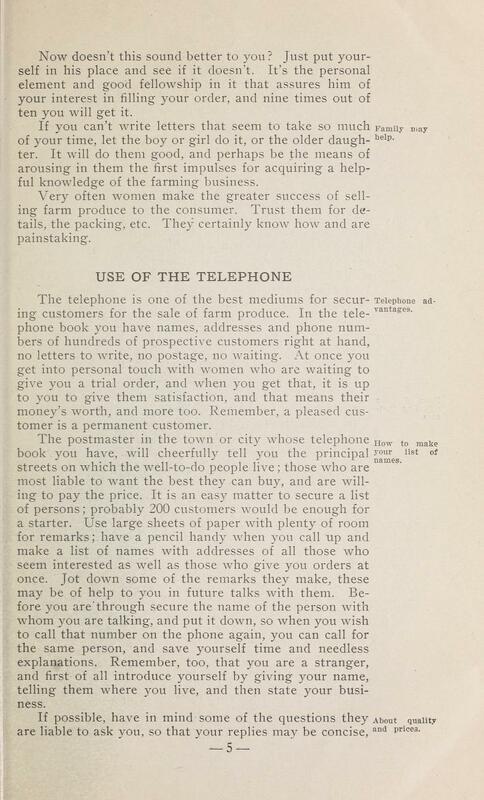 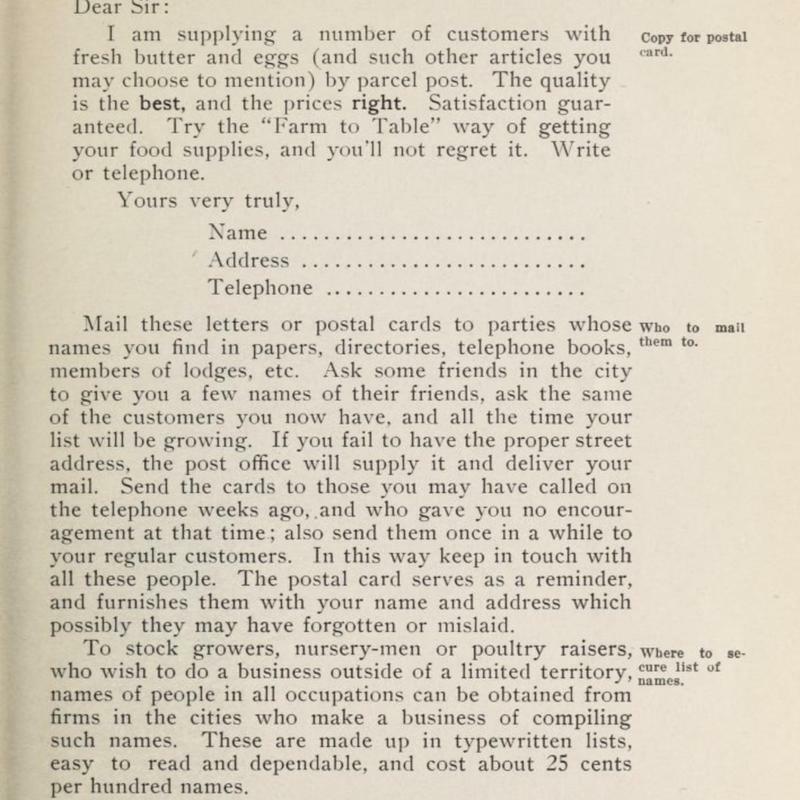 Farmers and producers who desire to ship in considerable quantities can, by proper organization, join in ordering large quantities of supplies, such as mailing cases, wrapping paper and twine, and in that manner secure to themselves the lowest prices, and reduce proportionately the cost of doing business. 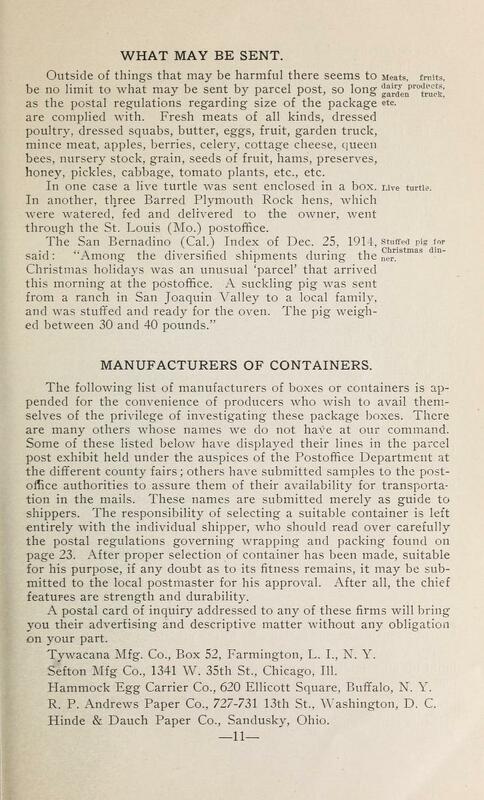 Producers will find it to their advantage to impress upon their customers the fact that the larger the quantity sent in one parcel (not to exceed 50 pounds limit within first and second zones), the cheaper will be the postage rate.